As co-director of the Center for Applied Mathematics, Yunmei Chen is applying abstract mathematical theories involving partial differential equations to real-world problems in fields as diverse as medicine and finance. One of the most promising applications of Chen’s work is in the area of bio-medical image analysis. She is currently collaborating with researchers in the Department of Computer and Information Science and Engineering and UF’s McKnight Brain Institute on the development of mathematical models and numerical algorithms for medical image segmentation, registration, reconstruction and restoration. Chen is also actively involved in projects related to functional magnetic resonance image (MRI) and diffusion weighted MRI to study the changes and connections in brain function and structures. In addition to continuing her work applying partial differential equations, Chen is pursuing another project that applies mathematical modeling to examine the informational content of stock prices. 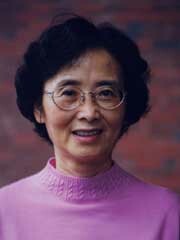 Chen’s research team has garnered more than $3.5 million in funding. In 2002, the College of Liberal Arts and Sciences awarded her a Gibson Term Professorship.